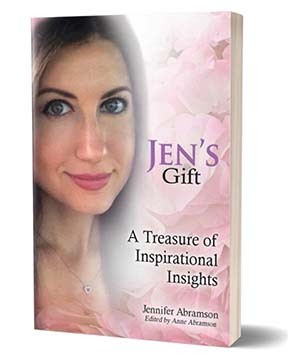 I want to introduce you to a special book which was recently published as a testimony to Jennifer Abramson’s brief but wonderful and impactful life. Jennifer was a beautiful young woman who graduated with a BA in Communications from Rutgers and worked for a publicist until discovering her passion for acting as a corporate host and spokesperson while acting in commercials. But life can change on a dime. Jen developed Lyme disease and was exposed to black toxic mold which entered her body. After years of treatment for Lyme and mold, she developed Complex Regional Pain Syndrome CRPS Type 2. Rendered homebound with indescribable pain, Jen created her Instagram account posting beautiful, unique photos with insights, quotes, clever humor, and wisdom that will inspire you. Jen passed away in November 2016. Her Mom took her creation and published it, hence we have Jen’s Gift! It is truly a special read and will touch your heart, a book for all ages. ALL proceeds from the sale of Jen’s Gift will be gifted to RSDSA, to help promote greater awareness of CRPS, further research, and help find better treatments and a cure.